Malta is a full EU Member State with a sound financial services framework and strong corporate governance. Pension schemes are individually regulated by the Malta Financial Services Authority. Malta adopted UK pension rules in 2016 and can offer flexi-access retirement benefits from age 55. Malta applies a withholding tax of 35% to pension income; however, in many situations this does not apply due to the 70+ DTAs which exist with many jurisdictions being afforded total or shared taxing rights. The Scheme is established under a Trust Deed. For residents of countries which do not recognise trust law, we offer a contract-based QROPS. This is subject to the same governance and regulatory oversight as the trust based scheme but has been established under a Deed. We offer a QROPS which is designed and administered to qualify as a pension fund under the USA/ Malta Double Taxation Agreement (DTA) treaty and which therefore may be suitable for USA residents, subject to advice from, and only available through, suitably regulated advisers. Gibraltar is a member of the EU by virtue of its connection to the UK and is therefore subject to the financial controls as per other member states. Pension regulations introduced in March 2017 require all personal pension scheme operators to be regulated by the Gibraltar Financial Services Commission. Gibraltar offers retirement benefits on a capped drawdown basis from age 55, which is taxed at a benign rate of 2.5% and open architecture investment options. The Scheme is established under a Trust Deed. We also offer a trust–based QROPS which has received a ruling from the Australian Tax Office that it meets the criteria to be treated as a “Foreign Superannuation Fund” for Australian tax purposes. 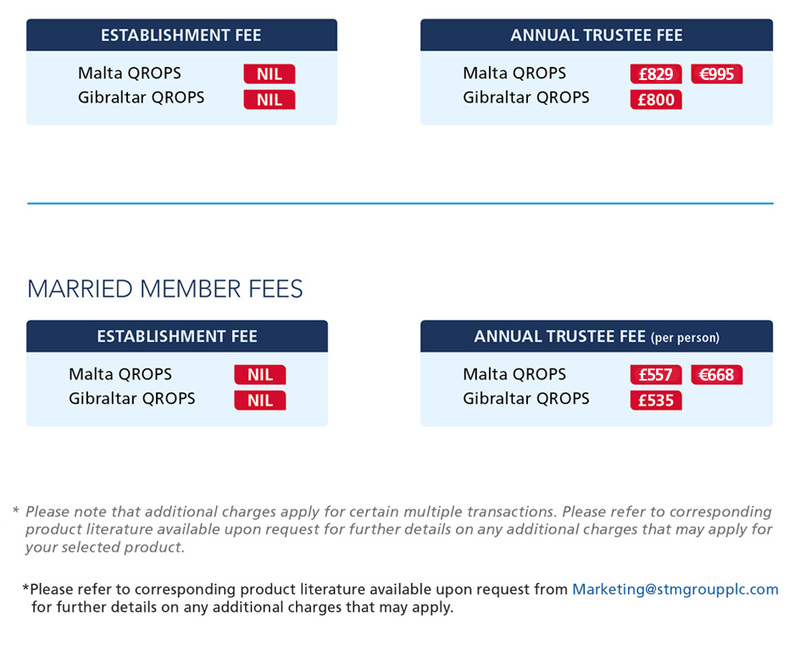 It is subject to the same regulatory standards and oversight as our other Gibraltar QROPS and offers the same investment and benefit options. If you are a professional adviser and would like more information on our Australian retirement solutions please contact one of our regional specialists. As the only QROPS provider with an EU Life Assurance business within the same Group (STM Life), we are able to provide a ‘one-stop shop’ packaged product for those looking for a QROPS and bond solution. The SMART Bond offers a simple, competitive charging structure with all custody and dealing fees included, resulting in an efficient and transparent product without any additional charges. The SMART Bond provides an online facility for both advisers and clients, ensuring valuations and statements can be produced with minimum fuss. Not available in the USA. * STM does not promote any of its own products in the USA and may only provide information and product materials to appropriately regulated professionals. STM does not provide investment, pension transfer, tax or any other kind of advice. Before determining whether to transfer UK (or any other) pension funds, individuals should consult with their own professional advisers.